Vienna must be the major convergence point for Donau Riders (Danube River cyclo-tourists) as it is bracketed by the much sought after flat, asphalt multiuse paths and it is also a huge public transportation hub. Riders funnel from the Donau and other rivers to the west of Vienna and from Slovakia to the east to either begin or end a tour. But as tested as we are as international cyclists, we were in shock our first hours in Vienna and we wondered how our fellow Donau Riders were faring. Little in the way of skill or concentration was required here. 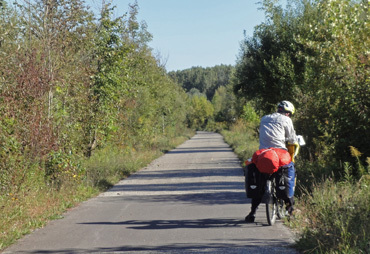 We, like all the other Donau Riders, had become accustomed to paths that were sometimes as wide as an European city street but without the competition and congestion from autos. On the Donau, cruising through a village or through a series of rare tight turns would roust us from our dream-like state for a few seconds and then we'd drift back to being on auto pilot. We'd occasionally get our hearts racing and our quads burning for a burst of cardiovascular work but our brains didn't have to match the escalation in effort while on the Donau. But that all changed in Vienna. Negotiating the extensive network of Viennese bike lanes and bike routes is a high-adrenaline sport for the visitor and especially for Donau Riders drugged by days of low-stimulation riding. It didn't take long for us to feel like losers in an action-packed computer game because our concentration had to dart between tracking the ever-changing route and watching traffic of all kinds in all directions. It was such a tightly played game that we experienced the adrenaline rush and weariness of riding in very dangerous traffic when it was actually fairly safe. We were thrilled when we finally found a route that was practically a fly-way to our center-of-the-city destination but the red painted path was no wider than our loaded bikes as it jogged on and off the sidewalks and into and out of the streets and twisted and turned around endless city-center obstacles. The presence of other riders behind us on this single-file-only path demanded a high tempo that had us feeling like ski racers on a slalom course for the first time. And the narrow, 2-way bike lanes with their right angles weren't sized for the turning radius of a bulky loaded bike like ours. Pedestrians on one side of us and moving cars on the other meant we couldn't just stop for a breather when we wanted one. 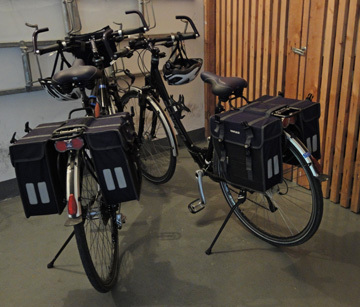 These panniers are larger than usual for Donau riders. Often we had our own set of bike traffic lights in Vienna and we learned the hard way that ours weren't always synchronized with the signals for pedestrians or motorists who were going our way. In some areas the bike traffic light on a sidewalk would turn red to allow a pack of waiting pedestrians to approach the street in anticipation of crossing it. Despite our personal challenges, the Viennese motorists and cyclists were very kind to us, the country-bumpkins, the Donau riders. 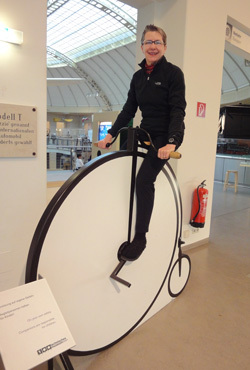 Unlike other places, our 'international cyclo-tourist' look that was emphasized by our heavy loads was recognized as predictive information: they knew that we didn't know; they knew that we were novices in a sea of pros; and they gave us some slack. Occasionally local bike riders would even yield their right away when they intersected us at tight turns and drivers would make space so which ever of us was lagging could cross in front of their car to catch-up with the lead rider. I can imagine that many of the Donau Riders were even more stressed out in Vienna than we were. We had a huge experience base to draw upon--somewhere between 50,000-100,000 miles of riding--and most of it on our own heavily loaded bikes. Many of the Donau Riders weren't even riding their own bikes, which was clear from their awkwardness on the river bike routes. Even on the Donau paths, many rode with a tentativeness in their bodies and strain showing on their faces, all of which must have intensified in the fast-paced Viennese traffic. 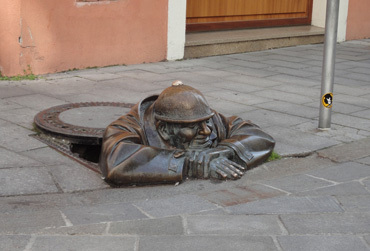 For us, Bratislava's public art was its best feature. We made the heart-pounding ride into Vienna 5 days ahead of our reservations for the sole purpose of hopefully picking up a small package at our hotel. Fortunately, our 3 hour detour through the city paid-off as the envelope containing our huarache kits sent from the US supplier was waiting for us. (More about that in SideTrips file "Minimalist Shoes II" which is coming soon). After fetching our parcel we rode on to Bratislava, Slovakia and discovered a Roman site in Austria along the way. Once at our hotel, a more careful look in our electronic guide book chapter on Bratislava revealed that there was precious little of interest to us in this capital city, so we shortened our stay and spent the extra days at a trio of Roman tourist sites between Bratislava and Vienna. Carnuntum, a Roman city that peaked at about 400 ce and that is now a tourist attraction, was well worth the visit. Austria typically does a fine job even with minimal ancient finds and Carnuntum was no exception. They are putting their site on the map by being the only Roman site in the world to be partially reconstructed on the original Roman site using materials and tools of the time--down to making a kiln to fire their own roof tiles. The ride back to Vienna from Carnuntum was much harder than it could have been, than it should have been. Monotonous scenery, unpaved bike paths, heavy gray skies, stiff headwinds, and the constant threat of rain made the flat, flat ride surprisingly hard. The posted distance to Vienna from our Roman sightseeing town was only 15 miles but it was more than double that by the time we made it to our hotel--and we already knew the way. 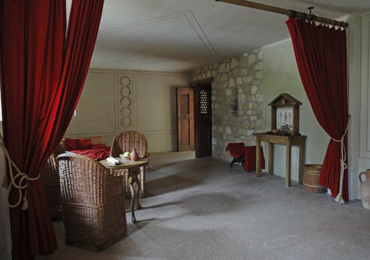 Reconstructed Carnuntum interior from 400 ce. A morning visit to the fine Roman museum at Carnuntum had us hitting the road after noon and then our ride was quickly interrupted when we found a rare bit of wind shelter and a picnic table for our lunch under a decidedly un-scenic overpass. It was 2:00 by the time we were really on our way to Vienna. To combat the tedium, we did what we never do and set a minimum speed of about 10 mph to hold, recognizing that we'd settle for anything when the gusts whipped up. It was a probably an unfortunate combination of inattentiveness due to boredom, a fluky change in the wind, unevenness on the grit trail, and reaching for a tissue to dab my dripping nose while resting in my aero bars that had me running a bit of real time video I never wanted to see, which was me and my bike flying off the path and down the steep grassy dike bank. Not by coincidence, there was road and not water at the bottom of this stretch of dike. I am meticulous about maintaining my attentiveness anytime there is even a remote chance of ending up in the water--having one's feet attached to the pedals on a submerged bike is a compelling image. I remember urgently feeling a need to control my bike but not being able to. I don't know now if that helpless feeling was due to the tires not being in contact with the ground or my hands no longer being in contact with the bars. Regardless, I soon went from a distinct sense of being in flight to the realization that I probably wouldn't stop sliding until my head rested on the gravel road below. Somewhere along the way I screamed, Bill saw more than he wanted to see of the event, and the rare pair of cyclists who had just passed us kindly came back to help. Luckily I was "OK" as crashes go. It's always amazing how skin can tear though only 1 of 3 layers of fabric are damaged, but that was again the case. I counted the bits of good news: after a couple minutes of stillness I could stand on my own; it was my right shoulder, not my previously dislocated left shoulder that had "shouldered the burden" as I slid; my bike was mostly OK; and after a few more minutes, I decided I could ride what turned out to be another 4 hours into Vienna. I stripped off my clothes when we were finally in for the night at dusk and discovered more superficial damage than I'd sensed on the road. There was that palm-sized, swollen bruise on my left thigh, the 'up side' of my crash, with a couple of red scratches across it. It wasn't until several days later that I finally decided that it was the shifter lever on the end of the left handlebar that had probably nailed my thigh as I was sliding down the slope on my right side. Then there was the euphemistically labeled 'road rash' or scraped skin on my right shoulder, the 'down side'. Bruises on both sides of both knees were further evidence of the general knocking around I received from my bike and the bank as I dumped over and then slid, still in my riding position with my bike, most of the way. This was all I rode for the next week. But in the room that night I reconfirmed that my most vulnerable joints--my TMJ (jaw); SI (pelvis), knees, and previously dislocated left shoulder--were completely spared. Those are high-maintenance areas of my body that I carefully manage on a daily basis and significant irritation to any of them can haunt me for weeks or more. It was a huge relief not to anticipate being punished by pain and limitations in one or more of those joints for the remainder of our touring season. The jarring to my brain, despite wearing a helmet, took 2-3 days to mostly clear so we delayed the intense concentration visits to Vienna's many museums and settled for strolling through the streets and parks for the first 2 days of our stay. The shoulder injury was still annoying a week later but fortunately it paled in comparison to last year's dislocation. I drew upon the wisdom of managing that dislocation to keep the uncomfortable shoulder fully involved in daily activities but postponed any serious rehab work for almost 2 weeks. Surprisingly, it was the twanging of all 3 of the 3 hamstring muscles in my 'down side' back thigh that was the most painful and difficult-to-heal injury I received. I could barely sit on the bike saddle after the crash because of the associated tenderness where the muscles attach to the bone and the tissue damage hampered my walking for a full week. I braced myself for managing nagging residual injury in those tissues long after the scabs on my shoulder had sloughed and the deep bruise on my thigh had transitioned through its various shades of brown to green to yellow then back to normal. My confidence in the saddle was also injured and for over a week of riding I had to stop and walk tight turns rather than pedaling through them. I took about 3 weeks, 1 off the bike and 2 weeks on the bike, for my confidence to mostly be restored. It was also at about the 3 week point that my hamstring muscles no longer completely prevented me from throwing my right leg over the rear of my bike to mount it. Fortunately, at the 3 week point, it looked like a full recovery wouldn't take too much longer. My most prominent thoughts minutes after I crashed persisted through the weeks of healing: it was very careless of me to have crashed but what an affirmation of my sturdiness and resilience that I pedaled away from it. Not bad for almost being 60 (!). Further thought had me laughingly concluding that there was no need for a bone density scan this winter as I'd already field-tested their integrity--just like Bill keeps talking his doctor out of doing EKG's on his heart because of all the steep grades we climb at 140-160 beats/minutes. It wasn't our hearts that were racing at the end of a long day in Vienna's Natural History Museum but our minds: it was what we'd learned about bacteria that had us still buzzing hours later. It was a little surprisingly as our professional careers had had both of us on a first name basis with all of the important human pathogens, but it wasn't the pathogens wagging our tongues now but the bugs at the extremes of time and the Earth. between the new stories about bacteria. The exhibits on the origin of the solar system and the early years of Planet Earth pronounced that the very first mass extinction occurred several billion years before mammals made their debut--the first mass extinction occurred sometime after 3.5 billion years ago when some bacteria began producing oxygen by photosynthesis. Oxygen was highly toxic to early life that evolved without it and all of those pre-oxygen era bugs died off en mass when the concentrations of oxygen in the newly formed atmosphere hit a critical level. Zooming ahead through many exhibit halls and almost 3.5 billion years, we were introduced to the recently identified "Deep Biosphere" in which bacteria were again the main actors. Apparently here the little guys are documented as living at least 6 miles deep in the earth and thrive by happily munching on minerals, without the conveniences enjoyed by many life forms, like access to the sun or oxygen. "Biomass" was again the attention grabber as it's estimated that the biomass of these subterranean bugs equals that of life as we think of it on land and in the sea. Both stories are of a lot of bugs, just like the comment that the bugs in and on our bodies exceed the number of cells in our bodies. Unlike the new information about bacteria, the special exhibit on Darwin was attention-getting more for the presenter's attitude than the content. In contrast to the US where the religious groups hold museum curators hostage, the Viennese curators labeled any question about the validity of evolution as "stupidity" and directly commented that it was unnecessary to honor the notion with even another sentence. 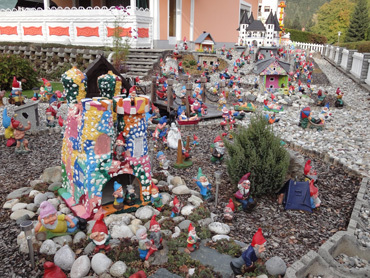 This was especially interesting as Austria is a staunchly Catholic country. 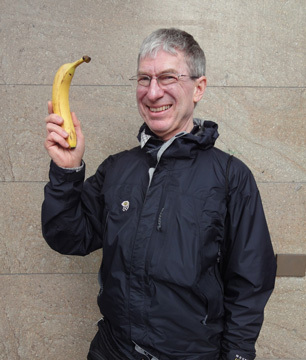 The most amusing fact presented was that about 50% of the genetic code of humans is the same as in bananas. The price of admission to the Natural History Museum looked like an even better value when we retreated to our hotel room and heard reference on the evening news to the "Goldilocks Zone"--a term we'd been introduced to at the museum that day. The Goldilocks Zone refers to the just-right-for-life conditions on Earth, and now 1 other planet. By chance, our museum visit had spared us from feeling obsolete, from feeling like we weren't keeping up with our English vocabulary. 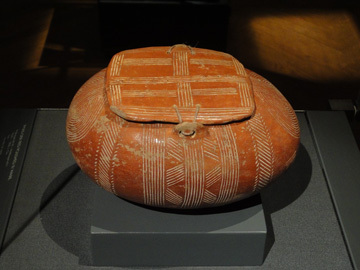 At the Fine Arts Museum in Vienna our fascination with minimalist footwear had us again admiring a surviving specimen of Egyptian reed sandals and viewing our first examples of ancient Egyptian flip-flops. And the ancient pottery finds from the island of Cyprus had both of us wanting to go there to see more but a look at a map reminded us of why we haven't been there--it is very far east. Roman technology employed in the 1500's. 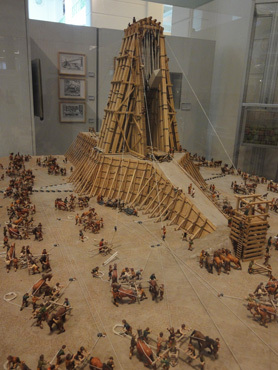 There were many thought-provoking exhibits at the Technology Museum though what had us going "But, but, but...." was a model of Romans lifting an obelisk upright--presumably one originating from Egypt. The 3 dimensional detailing of the pulleys and block and tackle systems at 45 stations powered by both men and beasts was impressive, though familiar, Roman Empire technology. Then we looked more closely to discover that what looked to be construction technics from more than 2000 years ago had been employed by Romans in the mid-1500's. "Those Romans...."
Quite unexpectedly while walking to the Technical Museum in Vienna, we passed by a new storage locker business. The arrival of fall and our subsequent shift to the "out of the mountains" itinerary are always accompanied by planning for our annual return to the States. At the end of August Bill had booked our early December flight home and the task of locating affordable and convenient off-season storage for our bikes had been on our "To Do" list for over a month. Each winter, either before or after Christmas, we return home for 6-13 weeks, depending upon the year. Every autumn we have the same pivotal question to answer, which is "Where shall we stash the bikes?" One issue is always the same, which is finding a secure place at a reasonable price. But the answer to the locality part of "Where?" is always different as the best place to leave them is often influenced by where the next riding season will begin. In 2009 we left the bikes and half of our gear in Seville, which was far from our departure airport in Amsterdam, but it made sense for our 2010 pre-season, non-bike trip to Morocco. "The kids" have wintered in homes, a hotel attic, a folk singers office, and a couple of storage lockers. Those indoor refuges have been in Athens, Dubrovnik (Croatia), Rome, Sicily, Seville, and Florence, and they've also flown home with us more than once. Vienna had not been a consideration for a storage location for this year but the very professional and efficient young businessman convincingly answered all of our questions. Even better, he shrugged off issues that had almost been deal-breakers at other storage businesses in Europe--and at about half the previous prices. By the time we left the Museum in mid-afternoon, we were tentatively planning on making Vienna our pivot point for 2010/2011 based on the chance conversation at the locker office. Cute, but this wouldn't be a part of our exit strategy. Walking back to the hotel from the museum we thought to look for ultra-cheap suitcases as they are always needed for our flight home, and Bingo!, there was a shop with $20 suitcases in a loud pink like "Hello Kitty" products. The next day we found another shop with similarly priced luggage so a problem that usually gets solved 10 days before we fly home was already history: we knew where to buy the luggage and had a back-up retailer too. Before we reached the hotel on our way from the Technical Museum we dropped in at the neighborhood train station and discovered it had fairly direct trains to hub cities aiming towards Amsterdam. We couldn't believe our luck: finding a bargain-priced storage unit, inexpensive suitcases, and favorable train information without going out of our way on a 'museum day' was exceptional by any measure. All that remained was to check hotel prices online when we were back in our room to establish that affordable lodging was available in Vienna and our Germany lay-over city. Less than an hour later all of the details for the complicated week before our flight were known. The following night Bill booked our train tickets from Vienna to Amsterdam as he previously had learned that advance ticket purchase through the German rail company garners a 75% discount. We were stunned. Not only were the nettlesome problems all unexpectedly solved in a single day, every facet of the plan was at rock-bottom prices, including the storage unit, the train rides, the hotels, and the luggage. Two months before we were to fly I had all the information I needed to make my grocery shopping list for our 7 meals to be eaten in pre-flight transit. It's never been this easy, with the bike storage always being the most uncertain element. Even when we rent storage units we don't usually know that the deal will go through until we are almost out the door because of our non-EU citizen status. We extended our stay in Vienna by a day....just 'cause. We were scheduled to hit the road on a Sunday, which is always a more day difficult travel day for us in countries like Austria where the food stores observe Sunday closures. Better to linger until Monday and not carry so much extra weight as the burden from the additional provisions adds up: there is the 2 lb cauliflower for Sunday night's dinner; the 2 cans of beans for Monday's breakfast and lunch; and all the rest. Slowing our tempo for the first 2 days in the city to ease my crash recovery had also taken a bite out of the week, adding to the appeal of staying an extra day. And importantly, the internet special Bill secured for our tiny 4 star room could be extended, so it all made sense to postpone leaving Vienna. Hanging around "low-impact targets" in the river villages. But on Sunday morning, which would have been our departure day, we awoke to hear that the US State Dept was on the brink of issuing a warning to Americans traveling in Europe because of the increased terrorist 'noise' on the airwaves. Not an urgent matter, but it underscored the wisdom of not being in the cities and at the major tourist sights and we lamented that we weren't on our way out of the city that day. 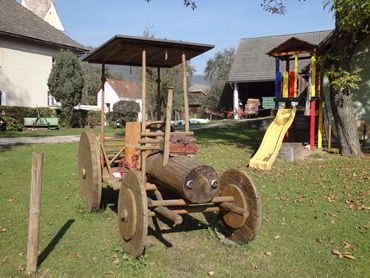 Our preferred mode of travel is on the back roads and in the villages, which also seem to be the safest places for Americans in Europe to be. Ten years ago it was on the river routes and in the villages where we sheltered our jarred nervous systems after the trauma and fear triggered by the 9/11 attacks and once again those places would be our refuge. Those are soft targets but with almost zero impact, making them--and us--essentially non-targets. 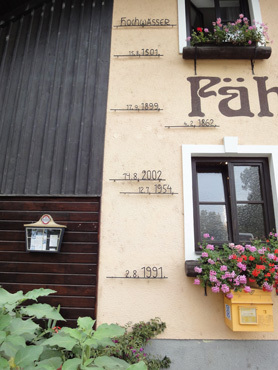 High water marks on a restaurant facade. By October, 2010 had mostly been in the "lose some" category when it came to the weather but we had been on the winning side in other ways. As Bill was planning our exit south from Vienna, drifting into Hungary along the Donau River had been an obvious option. "Too late in the season" was his final conclusion as he aimed us towards northern Italy along the Drau River instead. Unbeknownst to us, as we were unsuccessful in tracking a fairly straight line out of Vienna on a Monday morning in the fog, the highly toxic red sludge in Hungary had already breached its earthen borders and was headed towards the Donau. By Thursday of that week the toxic brew was contaminating the Donau at the Hungary/Slovakia border. Even though we were pedaling away from the terrible environmental disaster, I couldn't help but inspect each river and stream we crossed or paralleled to make sure it wasn't tinged red. After narrowing escaping being trapped by the devastating European floods while in Czech Republic in 2002, I habitually watch for signs of rising water that might present a safety threat to us and now I suspect I will always subconsciously be judging the water color also. Whether it be terrorists, noisy school children loose in hotel halls at 2 am, or toxic sludge, we try hard to navigate around trouble so we were relieved to be headed away from Hungary, away from the Donau during this "event". 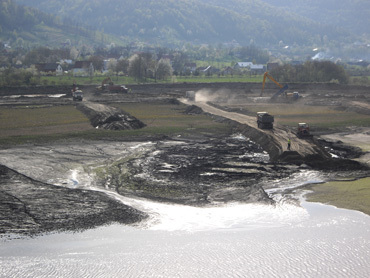 Hearing mid-week reports of Hungarian villagers bulldozing the toxic sludge into the nearby river confirmed that we were going the right direction and had us reviving a chant from our travels to Montenegro in early 2009 which was "They just don't get it." The toxic settling pond next to our Mojkovac hotel. It was disappointing but not all that surprising to hear reports of the same short-sighted remedy being employed, at least briefly, with the current disaster in Hungary. Already heading the other way put this rather arbitrary route selection away from Hungary in the "win some" category. Map Man's fortuitous route selection away from Hungary's toxic sludge event had us heading towards Austria's Semmering Pass, which is the only pass that has flat-out defeated us, the only pass that was in the "lose some" column. That defeat occurred during our first touring season, in 2001. Semmering Pass is a relatively easy pass but we bailed when we could no longer push our bikes up the steep grades of the ice covered road that first fall abroad. Had we been a couple of days earlier in 2001, the road would have been ice-free and we would have made it. As it was, we walked our bikes downhill to the last tiny train station we'd seen and waited for the big-wheels to haul us up the last bit to the summit and considered ourselves lucky to have had an alternative. 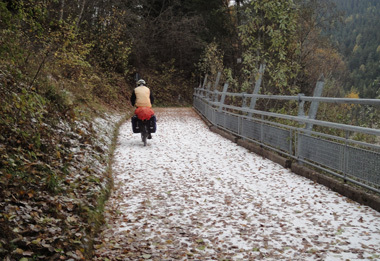 It wasn't a big to-do to finally conquer Semmering but it had the same appeal in the fall of 2010 as in 2001: it is a low, relatively easy way to work our way south as winter approached. As we pedaled ever higher up to the pass this October, I looked forward to snapping a photo of that little train stop high above the road where we waited to be rescued in 2001. We were recognizing absolutely nothing as we rode towards the summit but thoroughly expected to spot our turn-around point, our point of defeat. We vividly remembered the house on the road from which a woman emerged to chat with us about the travel conditions ahead. And our memories of how the little train station was situated on the opposite steep hillside were the same. But as we pedaled and pedaled in the fog this year, nothing looked familiar. Finally Bill flipped on his Garmin GPS and discovered that the upper reaches of the road had moved sometime in the last 10 years: sometime since we'd been there and sometime since "Gar's" maps were made. The new road was much wider and much less steep and appeared to now be a year-round rather than a seasonal route through the mountains. As it was, we recognized nothing of the trip up nor down--it was an entirely new experience--which was a bit disappointing despite successfully cresting the pass with this second attempt. Making it over Semmering Pass lined us up for our last BikeLine route of the season, which was along the Drau River. The official route ends at Maribor, Slovenia, though that was our starting point. The route approximately parallels the river to Dobbiaco on the Austrian/Italian border, near the Dolomites, and the book includes an 'accessory' route further south to Bolzano. It's probably the only BikeLine book that we've ever followed from cover-to-cover as Bill usually selects only a choice slice from a given book. The original bike path (R) was buried by a February landslide. We've ridden many parts of the Drau route (without the guide book) one or more times, but usually in the 'proper' downstream direction instead of backwards as we did this fall. Going backwards on a route makes it harder to follow both the instructions in the book and the posted signs, but we had a wonderful time as it reeled us into a part of the Alps that we love. 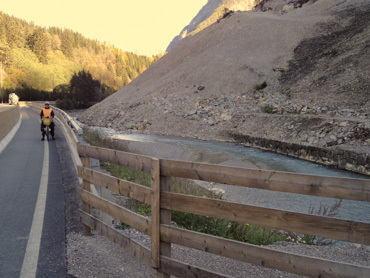 Unlike many of the other Austrian bike routes, most of the official Drau 'radweg' is a Rambo-route. Much of it is unpaved and not all of the unpaved paths are on nicely packed grit as it has long stretches on steep, narrow roads previously rutted by seasonal rivulets. The route provides an almost daily diet of multiple, short 10-15% grades which are exhausting when they coincide with the rough gravel surfaces. Luckily, going backwards on the route meant we went downhill instead of up on a couple of patches of 18% grade. Our arms and legs ached every night from the combined effort of pedaling and keeping our heavy bikes upright on the jarring surfaces. But despite the required athleticism of the recurring challenges, we were immensely pleased to be where we were. Most days were bone-chillingly cold but only 1 day delivered an all-day rain event. The fall colors were stunning with the stag-horn sumacs at the lower elevations being show-stoppers in their crimson best and the yellowing needles of larches adding color gradations amidst the higher elevation conifers. There was snow & ice on our route the last 2 days to the summit. The real visual treat however was the dusting of snow on the mountains. We'd seen many of the peaks a number of times before but they were usually uninteresting because of being darkened by their own shadows. But the light snowfall of a few days prior (when we were being drenched by rain) was perfect for revealing the previously hidden details of the rocky surfaces. Fault lines, giant slabs, deep crevices, and major strata were stunningly accented by the recent snow. We stopped dozens of times to admire the previously unseen features on the snow-laced peaks and couldn't look at them enough. The threat of darkness and the need to be in for the night often had us finally curtailing our ogling. Riding the Drau River this fall was as enchanting as riding and hiking are in the Dolomites in the summers. The stunning visual treats, the vigor demanded from our bodies, and the joy of experiencing it all safely out of traffic for 2 weeks had us wishing the experience could go on forever. We hated to leave but as it was, we traversed the low pass at Dobbiaco with a little snow on the ground and 2 days before the next snow event. Unlike attempting Semmering Pass a couple of days too late in 2001, we cleared the pass at Dobbiaco with 2 days to spare in 2010. We did our best to firmly anchor in our memories the vivid fall colors and the dramatic dusting of snow on the peaks paralleling the Drau near its source as we reluctantly closed the book on this part of the journey and headed downhill into Italy in search of warmer weather. Today was our last loaded riding day of our overseas touring season, though we'll make a farewell day-ride in the area tomorrow. We arrived a day earlier than needed to catch our train to Austria--the first of several "just in case" extra days in our long week to get to Amsterdam for our flight home. Volcanic eruptions, strikes, floods and other 2010 perils have given us new reasons to add 'buffer' days to our departure schedule. We are taking a series of trains to Amsterdam and will arrive there 3 nights before our December 2 departure to Portland--more "just in case" days to ensure that we make our flight. We'll be home for 3 months, then will spend 2 months hiking from a rented RV in the US southwest. After 2 weeks back at our apartment, we'll head for Europe in May for a slightly shorter biking/hiking season. Hope to see many of you while we are in town. Two more files are in the works: one is a brief look back at 2010, the other contains reflections on our 10 years of cyclotouring abroad.